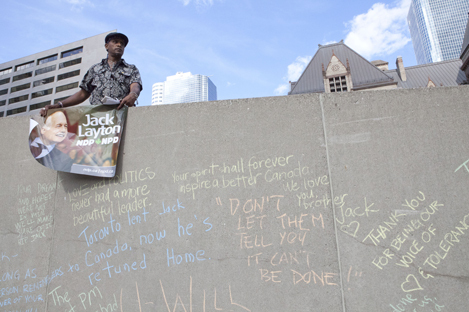 Jack Layton memorial at City Hall, from Now Magazine article: HERE. Thanks. A prominent politician who was well loved here in Toronto died this weekend. The picture is of a makeshift memorial that popped up at City Hall. We're usually a pretty grumpy bunch, so it was sweet to see an outpouring of emotion. Love this picture! So sad; he will be missed greatly!